CollegeComplete.com, the sponsor of Justin Lofton in the NASCAR Camping World Truck Series, will be co-sponsoring his Mint 400 class 1500 unlimited buggy along with General Tire as it continues to reach out to the public with its FREE EDUCATION ADVICE campaign. The last time Justin Lofton was behind the wheel of a race vehicle, he scored an impressive third place finish at the Daytona International Speedway in the NASCAR Camping World Truck Series (NCWTS) season-opener. Four weeks later, it's time for Lofton to get back to business. Though his No. Eddie Sharp Racing team in the Truck Series will see yet another week off, Lofton will be racing his College Complete (http://www.collegecomplete.com or 877-543-2655)/ General Tire No. 77 class 1500 unlimited buggy in the legendary General Tire Mint 400 off-road racing event in Jean, Nevada. Since its inception in 1967, the Mint 400 has been one of the most storied events in off-road racing competition, with many competitors calling it one of the roughest and toughest courses on the schedule. Lofton will drive the rough and tough 92-mile course four times. Jorge Lameda will be along for the ride, serving as Lofton’s navigator. Lofton, who started his racing career on mountain bikes, transitioned to off-road machines in 2004. He collected numerous event class wins before moving to stock cars. However, the dusty desert continues to beckon the 26-year-old and in December following the 2011 NASCAR season, Lofton earned the Henderson 250 win, dominating the buggy class with nearly a 20-minute lead. Fortunately for Lofton, with numerous breaks in the NASCAR Truck Series schedule this year, he was able to also add seven off-road events on his calendar, including this week's run in Jean. In addition to primary co-sponsors General Tire and College Complete (http://www.collegecomplete.com), who also serves as primary sponsor on his No. 6 NCWTS Chevrolet, the No. 77 unlimited buggy will also have support during the General Tire Mint 400 from MasterCraft, Fox Racing Shocks, Fortin Racing Inc., Dougan Racing Engines, and Rusty's Motor Car Inc.
Activities for the General Tire Mint 400 kick off Wednesday night with a parade on Fremont Street. Lofton will be participating in the driver autograph session at the Fremont Street Experience from 8 to 9:30 PM local time. For fans unable to make the Wednesday night event, they can stop by Fremont East on Thursday from 5:30 to 7 PM. Lofton will participate in the meet and greet following time trials. 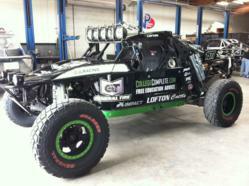 Lofton's General Tire Mint 400 run in the No. 77 Class 1500 unlimited buggy is set for this Saturday, March 24th. Watch the race and follow scoring on [http://www.racetheworld.net.